Frank Zappa Returns as a Hologram, Dweezil Responds. Frank Zappa’s oldest son, Dweezil Zappa, has spent years keeping his father’s music alive on tour with a real live band. 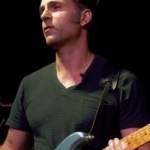 Dweezil’s mission has been complicated over the past few years, as his mother and now his younger brother, Ahmat Zappa, challenged Dweezil’s right to profit from playing his father’s music. “I’m thrilled that Frank Zappa will finally be going back out on tour playing his most well-known music as well as some rare and unheard material,” Zappa’s son Ahmet said in a press release. Dweezil, on the other hand, was forced to change the name of his successful and long-running Zappa Plays Zappa show, after his brother filed a cease-and-desist order against him. The drama has been ugly, and fairly out in the open with each brother penning open letters to the other. So it’s not hard to imagine Dweezil sees this as yet another attempt to undercut his work. Ahmet Zappa inherited control over the Zappa Family Trust about two years ago after the death of his and Dweezil’s mother. Elsewhere in his statement regarding the hologram show, he confirmed Adrian Belew, Steve Vai and other former Zappa band members had expressed interest in being involved. No shows have yet been announced.